Because of its rich history, impressive architecture, and world-famous cuisine, Europe is consistently high on most travelers’ bucket lists. And for folks in the US, award flights to Europe are more available than ever thanks to the power of miles and points. Just remember, you don’t have to fly there and back on the same airline! Sometimes you’ll get a better deal (and more available award seats) by booking one-way flights on different airlines. Or you might mix-and-match because you don’t have enough points in 1 program for a round-trip ticket. We’ll show you 5 cheap and simple ways to fly to Europe using miles and points, whether you’re traveling solo or want to bring along the whole family. United Airlines miles are my favorite way to book award travel to Europe for many reasons! The most important is that United Airlines is a member of the Star Alliance, which has the most daily flight options between the US and Europe. More flights each day mean more award seats, and an easier time finding a flight that meets your personal needs. Because United Airlines has such a diverse route network within the continental US, United Airlines miles are a great option for folks who don’t live near major airports. For example, you might have many choices of airline if you plan to leave for Europe from New York City. But for folks who are based in smaller cities, you’ll need to connect to a larger, international airport before you fly across the pond. United Airlines makes it easy to search for these flights on their own website, and even conveniently pieces together trips that contain flights on both United Airlines and one of United Airlines’ Star Alliance partners (for the longer, international flight). Note: One unique (and frustrating!) aspect of United Airlines’ award chart is that you’ll pay more miles for flights in Business Class and First Class when you fly with one of United Airlines’ Star Alliance partners. Redeeming United Airlines miles for a Star Alliance partner airline award flight in Business or First Class requires more miles, and is less of a bargain. Although the Business Class price is reasonable depending on your needs, I would completely avoid First Class on a partner airline. 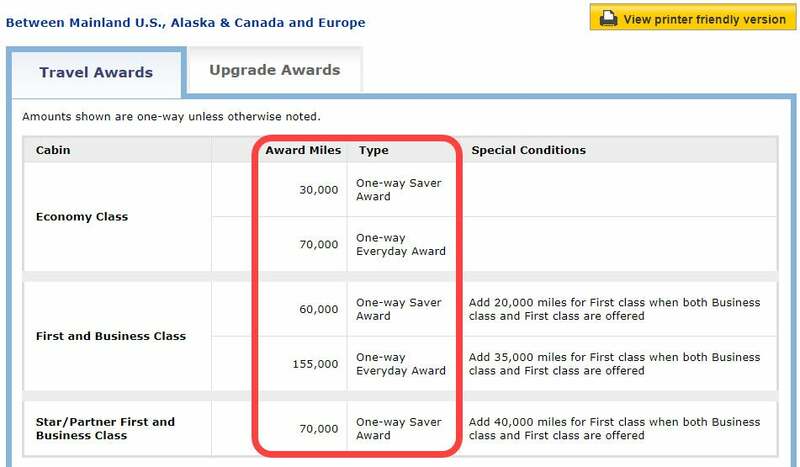 After all, 110,000 United Airlines miles one-way in First Class is nearly 4X the price of an award flight in coach! Another benefit of using United Airlines miles is that they never add fuel surcharges to award flights. And you can even tack on a free one-way flight within Europe (just pay taxes and fees) with the United Airlines Excursionist Perk. For the full scoop on United Airlines, check out our Ultimate Guide to United Airlines Miles. Or you can earn miles directly with cards like the United Explorer Card. Like United Airlines, Air Canada Aeroplan offers another great option for using miles to fly across the Atlantic. Air Canada is also part of the Star Alliance, so has most of the same partners as United Airlines. One of the main benefits of booking flights with Air Canada Aeroplan is that they’re an American Express Membership Rewards transfer partner. Although Aeroplan has somewhat similar award prices to United Airlines, Air Canada splits Europe into 2 regions. This means you’ll pay slightly more miles if you want to book an award flight to Eastern Europe (Europe 2) as opposed to Western Europe (Europe 1). You’ll pay fewer Air Canada Aeroplan miles for flights in Business Class and First Class compared to United Airlines miles! But keep in mind, Air Canada Aeroplan adds fuel surcharges to their own award flights and flights on certain partners. So it’s always best to do the math and compare what you’re be saving in miles versus what you might pay in fuel surcharges. To avoid fuel surcharges, try to stick to Brussels Airlines, SAS, Singapore Airlines, SWISS, Turkish Airlines, and United Airlines when booking award flights using Aeroplan miles. These airlines do NOT pass along high taxes and fees, so you will be able to book award flights for as little money as possible! Booking award flights using Air Canada Aeroplan miles is quick and easy online at Aeroplan.com, although you do need to create a free account to search for award flights. For more information on how to use your Aeroplan miles (or how to transfer American Express Membership Rewards to Aeroplan) and specifics of Aeroplan’s region definitions, head over to our Ultimate Guide to Air Canada Aeroplan Miles. Also keep in mind that Air Canada Aeroplan allows stopovers on international award tickets, so if you’re looking to visit more than one country in Europe, they’re a good choice. You can read more about Air Canada Aeroplan’s routing rules here. 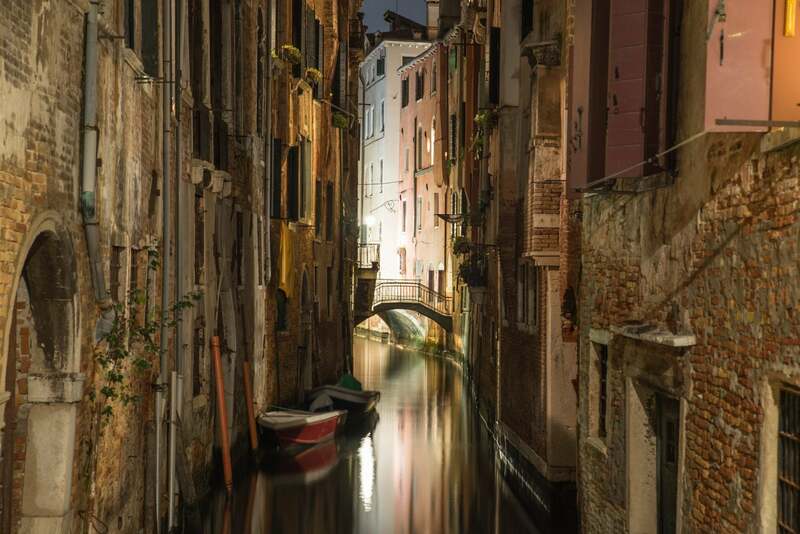 American Airlines miles can also be incredibly valuable for award flights to and from Europe. American Airlines has several large hub cities throughout the continental US, which offer dozens of daily, non-stop flight options to Europe for folks who live in Phoenix, Los Angeles, San Francisco, Chicago, Miami, New York, Charlotte, and Philadelphia. American Airlines is part of the oneworld alliance and only has a few partner airlines that fly across the Atlantic. If you want to fly with American Airlines’ partners, you can choose from British Airways, Finnair, and Iberia. 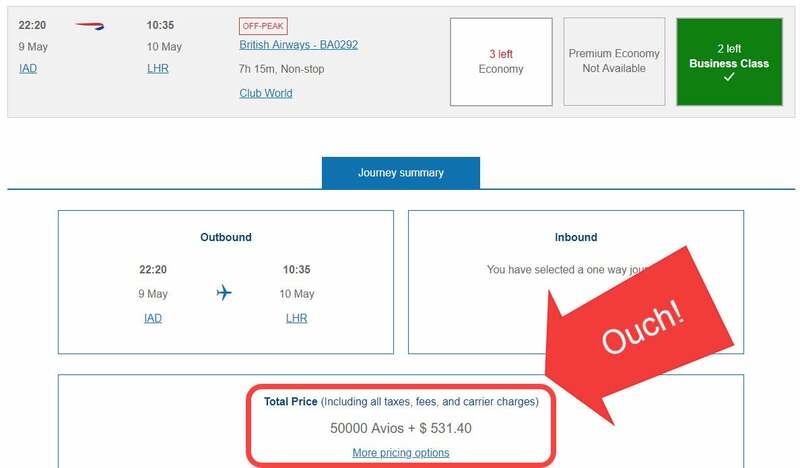 You’ll want to try to avoid flights on British Airways, because they charge extensive taxes and fees (sometimes up to ~$500 per person), even when flying in coach! All of American Airlines’ oneworld alliance partner award flights to Europe show conveniently on AA.com, and their online website is easy to use. You can even view available award flights, taxes, and fees without logging in to your AAdvantage account. American Airlines also offers off-peak award pricing during certain times of the year, making award flights to Europe some of the cheapest available! These off-peak award flights are only available in coach from January 10 to March 14 and November 1 to December 14. 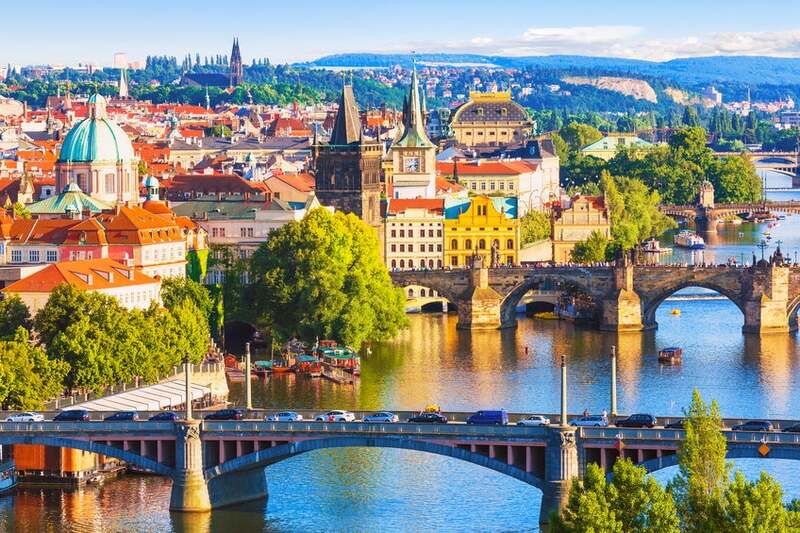 If you can plan your travel to Europe within these dates, award flights are even cheaper at only 22,500 American Airlines miles one-way in coach. 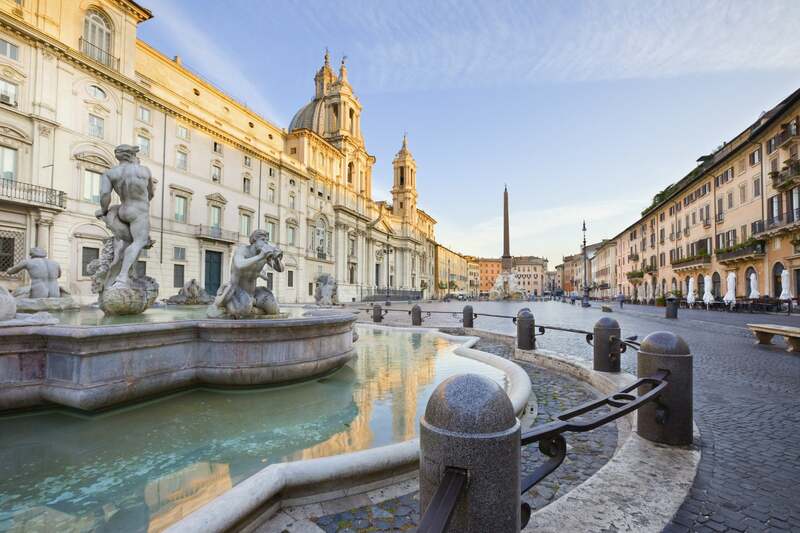 For an in-depth guide on using American Airlines miles to book award travel to Europe, head over to our guide on How to Use American Airlines Miles. Note: If you’re a Citi AAdvantage Platinum or Barclays AAdvantage Aviator Red cardholder, you get 10% of your redeemed American Airlines miles back as a rebate, which makes award flights even cheaper! Remember that you can only earn a maximum of 10,000 American Airlines miles back in each calendar year. American Airlines is also a Marriott transfer partner, so you could also consider the Starwood and Marriott cards mentioned earlier in the post. Although I do NOT recommend that you book transatlantic award flights on British Airways because of high fuel surcharges, redeeming British Airways Avios points for flights on other partners can be particularly valuable. 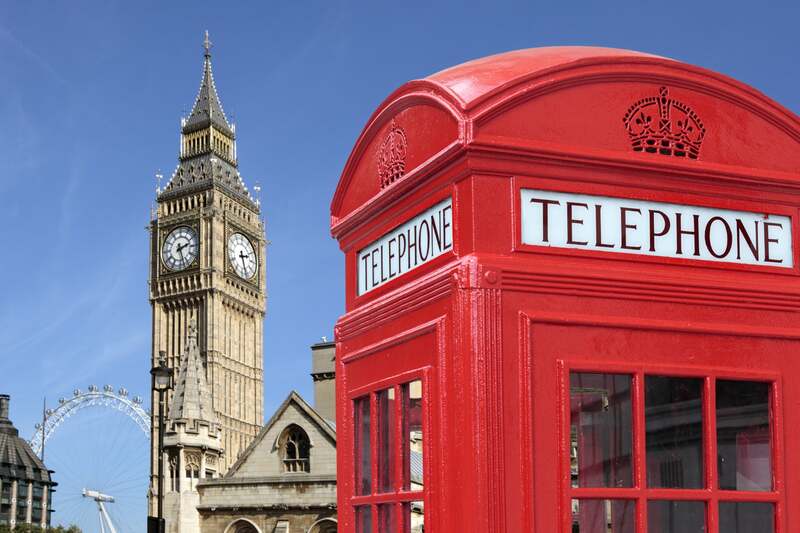 Folks on the East Coast or those who can find non-stop award flights from their home airports might find big savings when redeeming British Airways Avios points for award flights to Europe. British Airways is also part of the oneworld alliance (just like American Airlines), so you’ll have mostly the same airline options for transatlantic flights (American Airlines, British Airways, Finnair, and Iberia). But British Airways also partners with Aer Lingus, which has several non-stop flights from US cities to Ireland each day. And the taxes and fees on Aer Lingus flights are not nearly as high as British Airways flights. 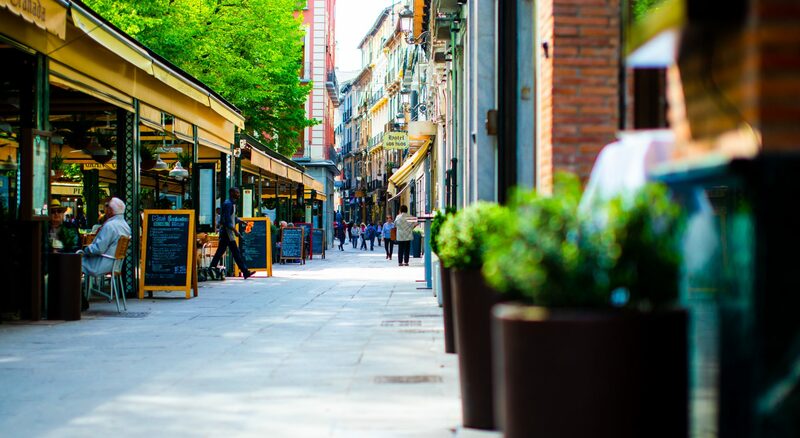 Finding non-stop flights is important when you book any flight with British Airways Avios points, because the number of miles required is not based solely on award region. Instead, British Airways uses a distance-based award chart to determine how many Avios points are required for a specific flight. And although it can be complicated, you can also find great deals! 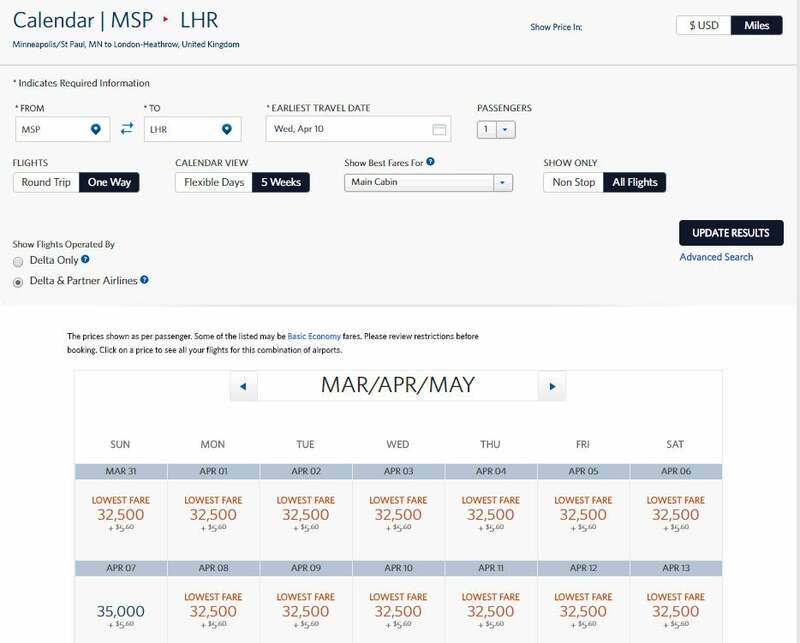 For example, an off-peak coach award flight from an East Coast city (such as New York, Washington, DC, or Philadelphia) to London can cost as little as 13,000 British Airways Avios points, but you’ll also pay ~$180 in taxes and fees (on British Airways flights). This is an option if you have fewer miles and are willing to pay some cash as well. The good news is that British Airways consistently opens lots of award seats and has a wider route network. So if you are less flexible on dates or destinations, British Airways can be a good pick if you are willing to spend some money on the taxes and fees. Try to Avoid Using British Airways Avios Points for Flights in Business Class and First Class Because You Will Pay ~$500 per Passenger in Taxes and Fees! Note: Even though British Airways has lots of award flights available in Business Class and First Class, most folks avoid these because the taxes and fees are often more than $500 per person! You can earn British Airways Avios points directly with the British Airways Visa Signature® Card. Here’s our review of the Chase British Airways card. And because British Airways is a Chase Ultimate Rewards, AMEX Membership Rewards, and Marriott transfer partner, you could consider any of the cards that earn these points mentioned earlier if you want more British Airways Avios points. Besides United Airlines and American Airlines, Delta is the last of the US “Big 3” airlines for European travel. Unfortunately, Delta doesn’t offer a standard award chart, so it’s hard to know exactly how many miles are required for your European vacation unless you search for specific dates. On the other hand, Delta has tons of domestic flights, offering travelers easier access to connecting flights before traveling across the pond. And many folks find Delta to be the most reliable and comfortable US airline, so you might prefer to fly on Delta or one of its partners on your trip to Europe! Delta is part of the SkyTeam Alliance, and has a few partner airlines that fly between Europe and the US such as Air France, KLM, Virgin Atlantic, and others. But to search for award flights using your Delta miles, you’ll have to start at Delta.com — because Delta doesn’t tell you in advance how many miles will be required. And typically, Delta will charge you more miles to fly on one of their own planes as opposed to flying with one of their partners. But by using Delta’s 5-week award search, you can get a good idea of how much award flights typically cost. For example, a quick search on Delta.com shows me that the cheapest one-way coach flight between the continental US and Europe is 32,500 Delta miles plus ~$6 in tax. And for Business Class, the cheapest award flights I found cost 75,000 Delta miles plus ~$6 in tax. So Delta’s low taxes and fees might be appealing for folks who have higher mileage balances but want to spend as little cash as possible! Delta does NOT allow you to redeem miles for international First Class, and Delta does not offer international First Class on any of its own planes. 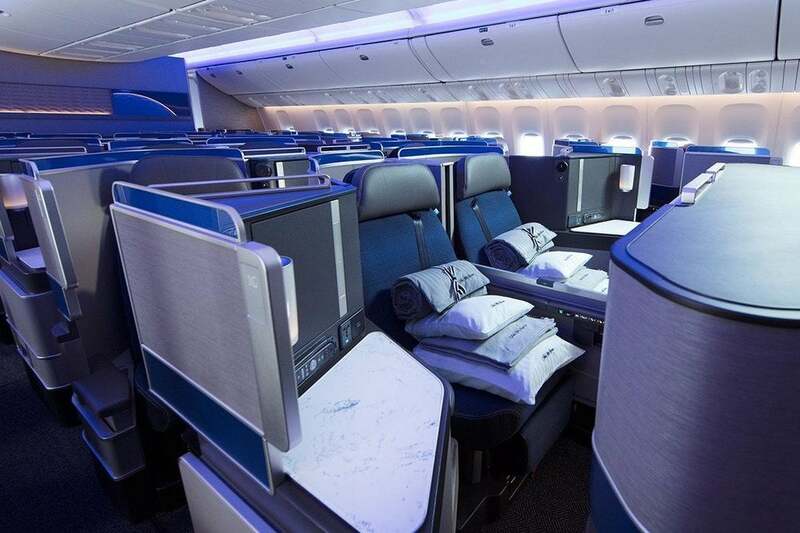 If you want to fly in First Class, you’re better off booking with American Airlines miles or Air Canada Aeroplan miles, as discussed above. For more details on booking award flights with Delta miles, visit this post on how to book award flights with Delta miles. Keep in mind, Delta is also an AMEX Membership Rewards and Marriott transfer partner. So you can boost your Delta balance by applying for the AMEX Membership Rewards, Starwood, and Marriott cards mentioned previously. If you’re looking to travel to popular destinations like Europe, it’s helpful to have several options. 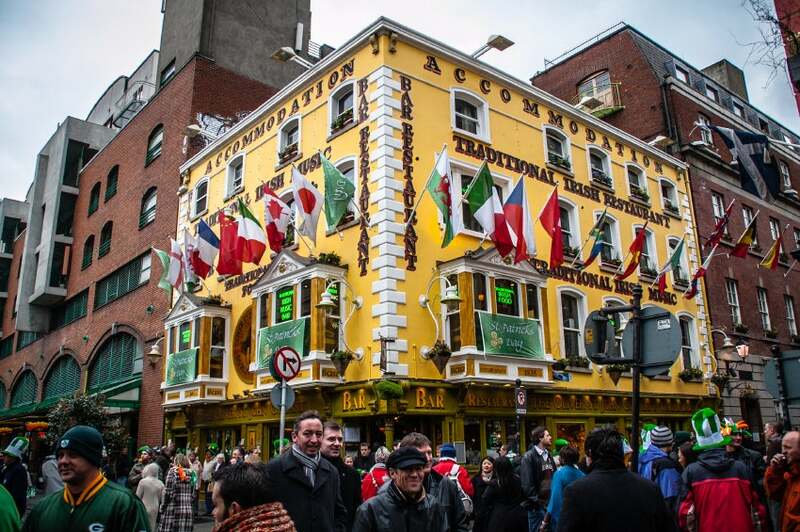 And for folks looking to save money, these 5 booking options are among the best for cheap and convenient award travel to Europe, especially if you have to connect from a smaller city to a major US international airport before crossing the pond. 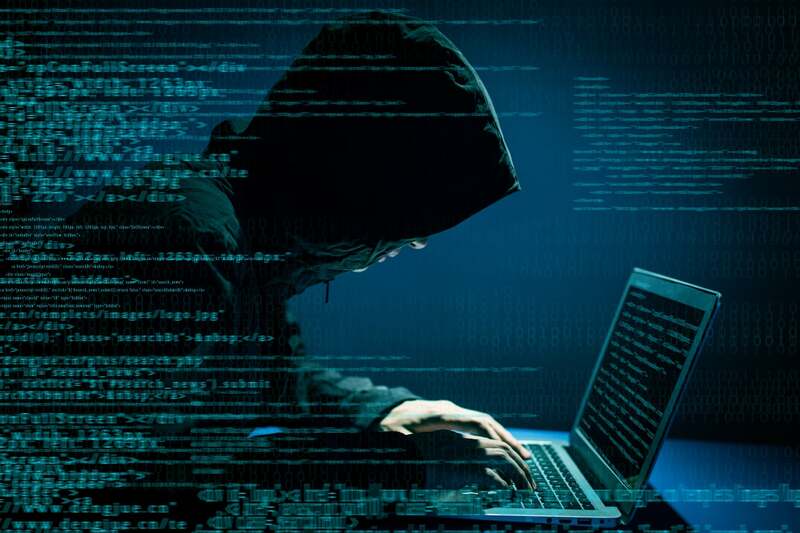 But keep in mind, cash rates on coach flights to Europe have been plummeting in recent years, so you might want to start your research on Google Flights to see if redeeming miles and points is a good value. If you want to fly in Business Class or First Class, award flights will almost always be a better value than paying cash. Where are you headed on your next European adventure? This is somehow informative but I don’t really know much about foreign airlines. However, I would save this as a bookmark and (might be) as one of my choices. Thanks. I’m hoping to fly to Ireland and/or England in summer 2019 with a family of 4. I have British Airways Avios, Are Lingus points (Avios? ), and many Chase points that I can use. Is there a smart way to combine these points, so that I can book 4 tickets together. I’m open to flying 1 airline to Europe and another airline home, but I do want to have all 4 people on the same flight. Any advice would be appreciated. You mention flying out of major US cities, but have you ever researched into flying out of some of the Canadian airports? I am halfway between Boston and Montreal and it seems cheaper sometimes to fly out of Montreal. Does it make a different in using points for these flights too?